Hurricanes and Alligators - oh my! 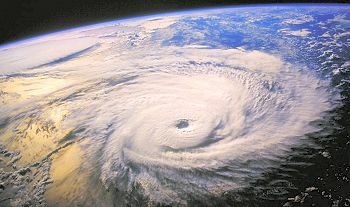 Hurricanes: The season is from June 1 to November 30 when storms form over the Atlantic Ocean and Gulf of Mexico and gather energy. There will be plenty of warnings before there is the likelihood of a hurricane reaching land. Listen to radio reports from the National Weather Center, or call the National Hurricane Center 305 229-4470 for information. Alligators usually live in fresh water and they are often seen sunning themselves along the riverbanks. Alligators aren't very aggressive and do not attack humans except under extreme circumstances. Crocodiles are more aggressive, but they are now an endangered species, and live mostly in salt water. It's a good idea to avoid any large reptile with teeth. 1. Feeding alligators - DON'T DO IT! It is illegal and dangerous to you AND them. 2. If the alligator hisses at you - get away from the area as quickly as possible -you may have gotten between them and their young. Police cars have flashing blue AND red lights. If you question whether you are being pulled over by a legitimate officer, then keep driving and get to a well-lit populated area, and call 911. If you are bumped from behind, don't get out to exchange information. Just write down the license number and go to a populated area. Call the police if you are suspicious. International tourists: Be aware if you go to the exchange center that there may be people looking to take your money if you make it easy. Don't count it or flash it in public. Florida is generally a safer area than most other big cities but, as you would anywhere, be aware of your surrounding, and use common sense. Back to Hurricanes. When Hurricane Andrew roared across the park in August 1992 with 164 mph winds, Everglades National Park was severely damaged and was temporarily closed. The park's trees were the most dramatically affected. More than 70,000 acres of mangrove forest was flattened, along with a number of mature hardwood hammocks and between 25 and 40 percent of the pines. Also hit hard were park employees, over half of whom lost their homes. The original landmark visitor center was also destroyed, along with many of the man-made structures such as boardwalks and visitor information displays. The effect of the storm on the park's wildlife population varied from species to species. All of the 32 radio-collared deer that were part of an ongoing study survived. Also, resident populations of white ibis and egrets seemed unaffected, as were the few remaining Florida panthers that still use the park. On the other hand, alligators, which were nesting in August, were less fortunate. About 25 percent of that year's newly hatched young were in nests destroyed by the storm. In addition, about 10 percent of the known wading bird rookeries were in the direct path of the storm and some were destroyed. Big storms are not new to a habitat adapted to a hurricane-prone climate. Interpretive signs near Flamingo have for many years pointed out remnants of great trees blown down by Hurricane Donna in 1960. Though most species recover after storms, the process can sometimes take a decade or longer.